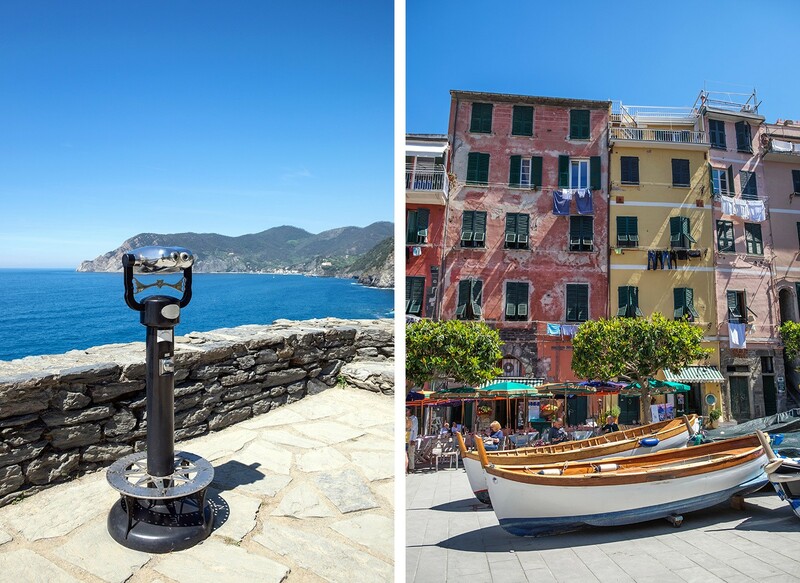 A string of coastal villages, with pastel buildings tumbling down the hillside, set around picture-perfect harbours with clear blue seas – over the last few years the Cinque Terre has become one of Europe’s top wishlist destinations. With the sun shining, a plate of pasta and a glass of prosecco in front of you, it’s not hard to see why. But an influx of visitors often means a rise in prices to go with it. 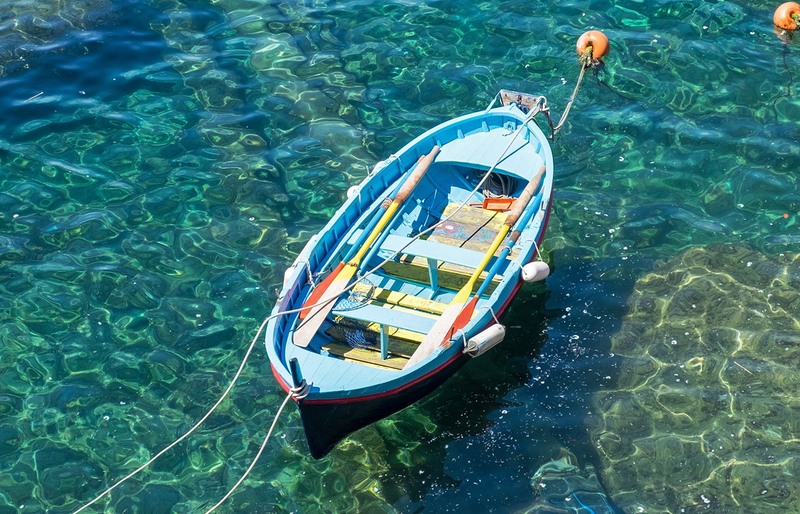 So do the costs of visiting the Cinque Terre match its popularity? Here I share my trip budget breakdown for spending five days in the Cinque Terre, Italy. 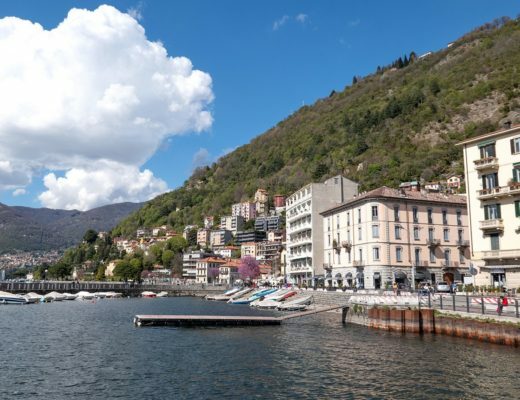 Accommodation is the biggest expense in the Cinque Terre – though you can save money by staying in neighbouring Levanto or La Spezia, which are easily accessible by train. We wanted to be right in the heart of things, so we booked a one-bedroom AirBnB apartment in Corniglia. There are only a few hotels in the Cinque Terre, and they’re limited to Monterosso and Riomaggiore, so accommodation is mostly apartments or guesthouses. Our apartment had an open-plan kitchen/diner/lounge with a sofa bed, separate bedroom, bathroom and balcony, as well as a shared roof terrace (where we spent most of our time). 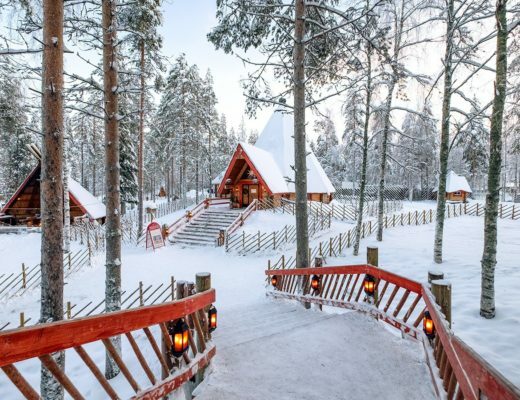 It cost €836/£720/$946 for four people for five nights (including AirBnB fees), which works out as €167/£144/$189 a night or €42/£36/$47 per person per night. There’s also a tourist tax of €1 per person per day – it’s capped at three days though so we paid €3 each for five nights. Total accommodation cost: €212/£183/$240 per person – €42/£37/$48 a day each on average. The easiest way to get to and around the Cinque Terre is by train. We had an InterRail pass as we were on a longer European rail trip, but the train from Genoa to the Cinque Terre costs €11/£10/$12 each way. Trains on the Cinque Terre line from La Spezia and Levanto run frequently throughout the day, stopping at each village and costing €4/£3/$5 for a single journey, irrespective of how far you go. So you can easily walk one way and get the train back. Our trains one day were covered by the Cinque Terre Card (see below) but we also took five single journeys, costing €20/£17/$23 in total. The other way to get around the Cinque Terre is using the public ferry – with some great views along the way. We didn’t use it that much as Corniglia is the only village without a harbour, so it doesn’t stop there. But we did take a day trip down the coast from Manarola to Portovenere, costing €25/£22/$28 return. Total transport cost (including return trains to Genoa): €67/£58/$76 per person – €13/£12/$15 a day each on average. 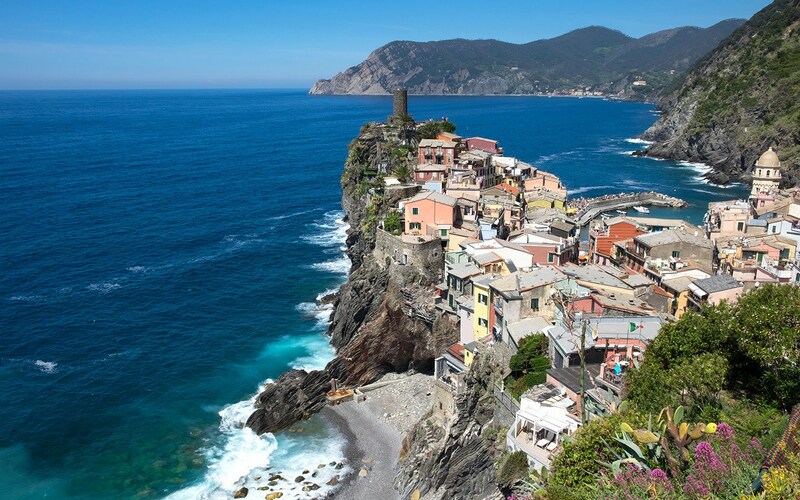 The reason most people visit the Cinque Terre is to soak up those amazing views, go hiking and take a dip in the sea, none of which is going to cost much. 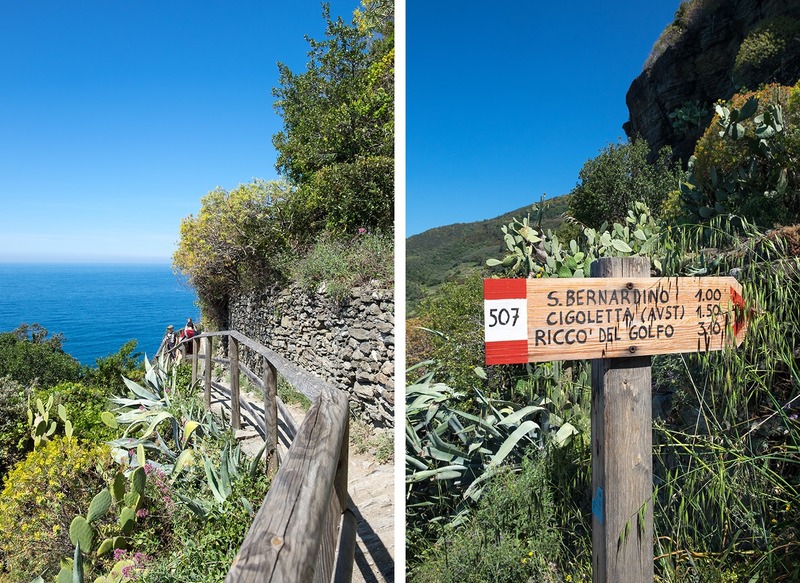 You do need to buy a Cinque Terre Card if you’re going to walk the coast path, but that only applies to the stretch from Monterosso to Corniglia (it’s closed from there to Riomaggiore for the foreseeable future after a landslide). A one-day pass costs €16/£14/$18 and also covers local trains and buses, wifi and toilets. We also did some of the hikes along the higher hillside paths, which are free to access. Other than that we took a boat trip down the coast to Portovenere (covered under transport) and looked around the castles in Vernazza (€1.50/£1/$2) and Portovenere (€5/£4/$6). Total activities cost: €22.50/£19/$25 per person – €4.50/£4/$5 a day each on average. 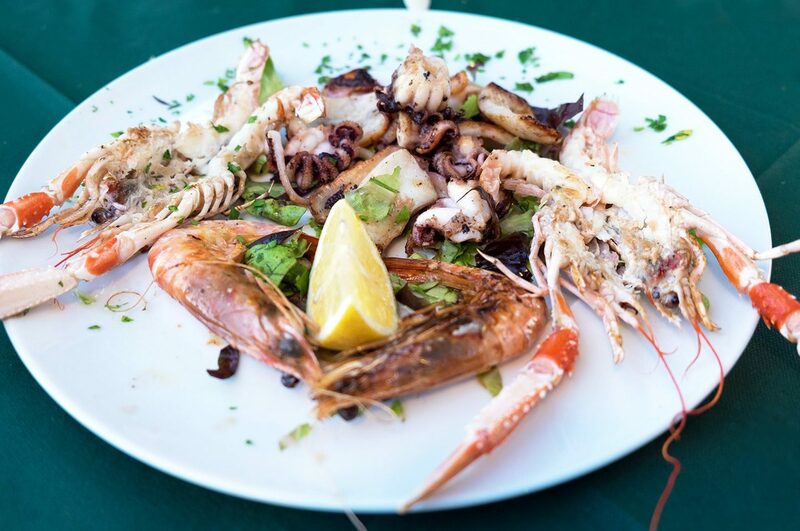 Food and drink is where the Cinque Terre starts to get a bit more expensive again – prices seem about a third higher than you’ll find in less-touristy bits of Italy. As the villages are busiest in the daytime you don’t usually find cheap lunchtime deals either. So to keep costs down we mixed up eating out and cooking in our apartment. We spent €85/£73/$96 on groceries between the four of us. That covered breakfast every day, snacks and two simple pasta dinners. There aren’t any big supermarkets in the Cinque Terre so if you’re self-catering you’ll need to stock up at the smaller grocery stores which can be a bit more expensive. We also ate out for lunch three times and dinner twice, and got takeaway pizza in Corniglia on our last night, coming out at €100/£86/$113 per person in total. An average lunch with one course and a glass of wine cost around €18/£15/$20. I’d always leave room for gelato though – we were right by an amazing gelato shop so tried a new flavour each night (total €10/£9/$11). 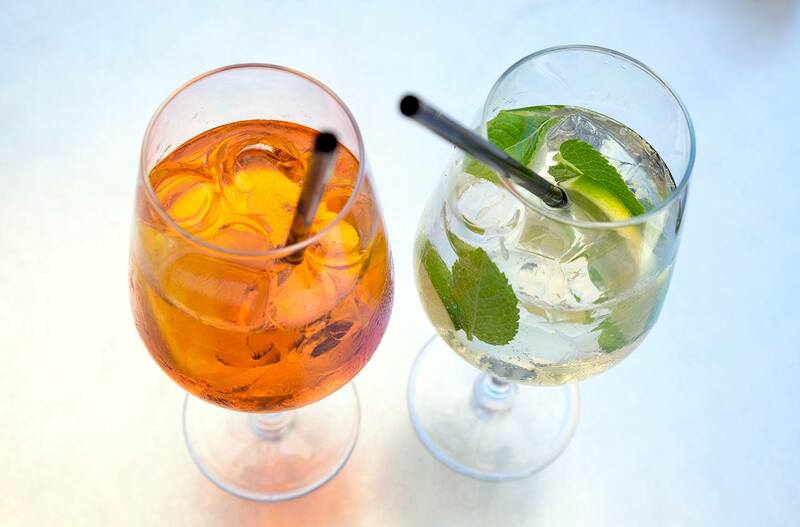 We went out for a few Aperol Spritzes and bought some wine to drink on our balcony (€37/£32/$42 in total). Bottles of wine from a local vineyard cost around €6 and a large beer €3.50, though prosecco was pricey for Italy at €10 a bottle (how much a bottle of bubbly costs around the world is my version of the consumer price index – the prosecco index!). Total food and drink cost: €168/£145/$190 per person – €34/£29/$38 a day each on average. The total cost for our five days in the Cinque Terre was €470/£405/$531 per person. This works out at €94/£81/$106 per day. Not a bad price for a wishlist destination like the Cinque Terre, especially as it’s crazily popular now. You could probably squeeze a visit into a day or two, but it doesn’t cost too much extra to stay longer – accommodation often gets cheaper if you stay for longer, you have time to self-cater and walk the free hillside paths. Lower budget? You could stay in Levanto or La Spezia rather than right in the Cinque Terre, where there’s a greater choice of accommodation and more budget options. You could also cook more of your own food, steer clear of the prosecco and stock up on groceries before arriving. Higher budget? If you want to splash out, there are some gorgeous apartments with private roof terraces – or several five-star hotels just outside the Cinque Terre. 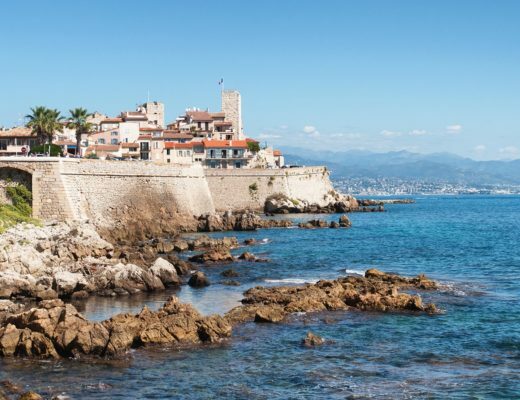 You can also hire a boat to sail the coastline, visit high-end restaurants and drink as much prosecco as you like! budgetCinque TerreItalyWhat does it cost? Cinque Terre is just gorgeous! As is your photography. : ) So does the place warrants vacation across the world all on its own, or is it better incorporated into a bigger Italy trip? Thank you! 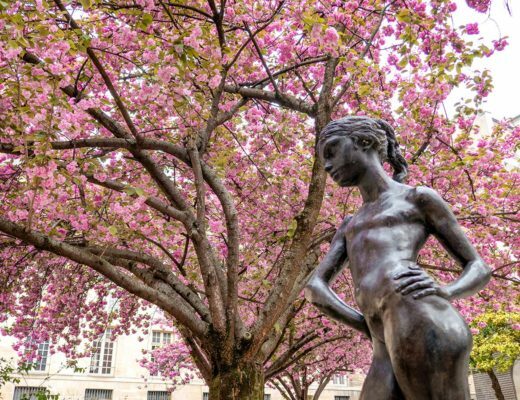 It’s definitely worth a trip, though in five days you can see a lot so you could easily combine it with other Italian destinations – Florence, Bologna or Milan are all not far away. It sounds as if Cinque Terre is busier and more expensive than when I went many years ago. I would love to go back again one day. It really is a gem but unfortunately no longer a hidden one. Yes it’s become so famous now (I blame Instagram!) that there’s a danger of it getting overwhelmed – off season seems to be a good way to go to experience it without too many crowds. 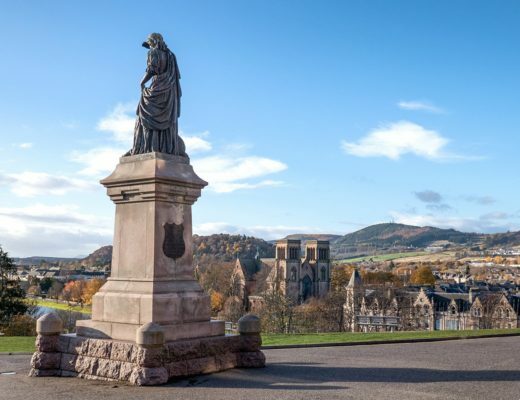 Really useful info Lucy – it sounds like a self catering apartment is a good way to making it more affordable, while still giving the flexibility to reat yourself with a meal out if you wish. Yes it’s one of those places where self catering is a really good option as you can get right into the heart of the villages. Such a beautiful part of the world. Good to know the break-down of costs. Thanks Lucy! Thanks, hope it comes in useful! Oooh I’d love to do a rail pass on the continent! The only hard bit is deciding where to go! What a useful post. I’ve always thought of Cinque Terre as being incredibly expensive, but yo’ve shown with some careful planning, it’s certainly within reach. Beautiful photos! Thanks, yes it wasn’t quite as bad as I’d imagined! And so worth it for those amazing views. Hi Lucy! 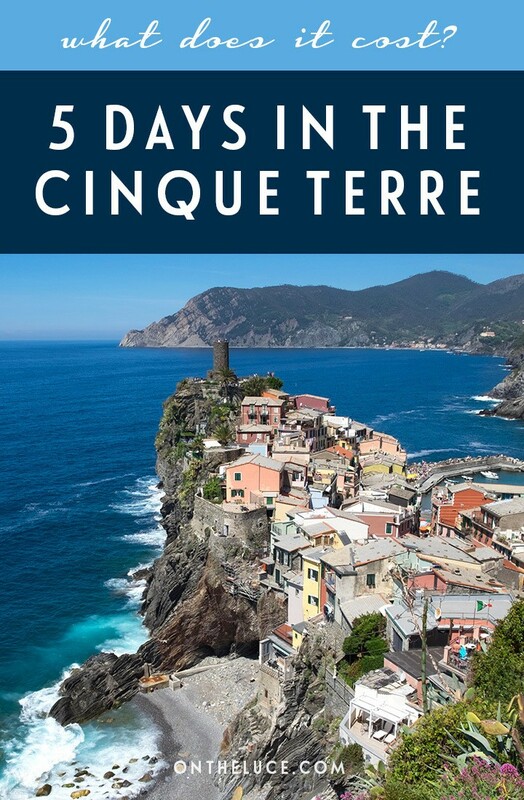 Can I ask you what month you visited Cinque Terre. 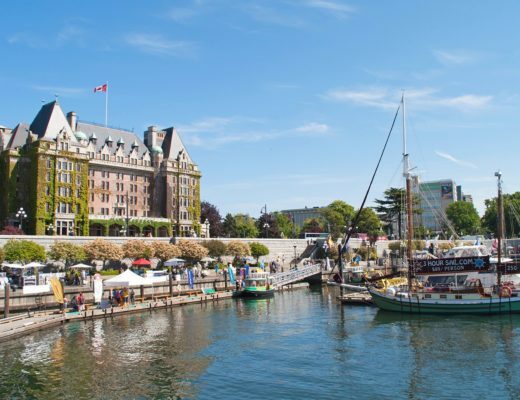 Hi I was there in May and would recommend it – not too hectic but still hot and sunny. Would it be okay to visit in the off-season? By November or December? Hi Chelsea, it can be a bit wet in the winter which means some of the paths might be harder to get around. If you get sunny weather though it should be uncrowded though and prices should be lower. Hi Lucy! 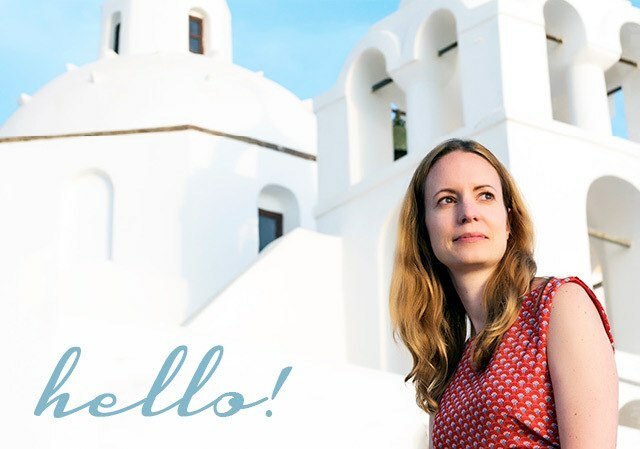 Thanks for the amazing information on Cinque Terre in both your articles. Read a few blogs lately but they didn’t give much info on the trails. I am going there for 5 days from 4th Sept to 8th Sept and hopefully I can discover as much as you did if not more. I have a question regarding money, I mean did you carry a lot of cash or you found ATMs in/around the villages. Are there many places that take debit cards for payment? Hi, great to hear the posts were useful! Money-wise we found that most larger restaurants took credit cards, debit cards are a bit less common though. But there are bank ATMs in each of the villages, plus smaller ones outside some shops (these can charge higher commission though so best use the ones attached to a bank if you can).